The girl has been identified as Arti Kumari, a teacher at Qasim Model School, and reports say she was abducted at gunpoint by a feudal lord named Ammer Wassan. A 19-year-old Hindu girl is said to have been kidnapped from near her home in Pakistan’s Khairpur district in Sindh this Saturday. 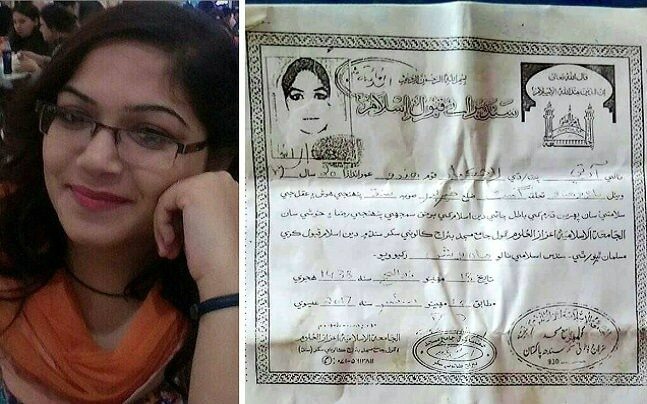 The girl has been identified as Arti Kumari, a teacher at Qasim Model School. Reports have it that she was abducted at gunpoint by a feudal lord named Ammer Wassan. An AP correspondent from Pakistan tweeted that Arti has been converted and renamed as ‘Mahwish’. The reported also claims that she has been “married off to a local Muslim boy”. A Newsgram report further claims that Arti was “coerced into signing an affidavit claiming that she married Bux and converted out of her own free will,”. The report quotes Arti’s uncle saying, “Arti is engaged to be married in November and is the second girl to be kidnapped in my family,”. The anti-conversion bill was unanimously passed in the Sindh Assembly. The bill criminalised forced religious conversions and guaranteed protection of minorities in Pakistan. As per the bill, those who attempt forced conversion could get up to seven years imprisonment and those who facilitate the conversion could get up to five years in jail. Another clause in the bill said that adults considering converting to Islam must be provided a safe house to live for 21 days, during which they can introspect and ensure they are not doing it at will. In December, shortly after the bill was passed, religious hardliners warned the Sindh government of agitation, describing the anti-conversion bill as an “anti-Islam bill”. A multi-party conference was held and by a consensus resolution, the parties called pushed the government to repeal the bill with immediate effect. “The bill binds youngsters in Sindh to keep their ancestral religion till the age of 18 years, which is in open defiance of Islam. It also binds newly Muslims not to disclose their Islam till 21 days and to spend this period at a safe house being run by the government where they will be briefed about other religions,” The Dawn quoted. In January 2017, the Sindh governor returned the anti-conversion bill, under pressure from Islamic hardliners. A News International report said that the Sindh chief minister told the governor that the government wanted to make certain changes in the language of the bill. This entry was posted in LATEST NEWS, LATEST NEWS - News, PAKISTAN, PAKISTAN - News. Bookmark the permalink.